I had to buy this llama print fabric when I saw it in John Lewis sale after Christmas! I had the last 2.5 metres on the bolt for around £10 if I remember rightly. 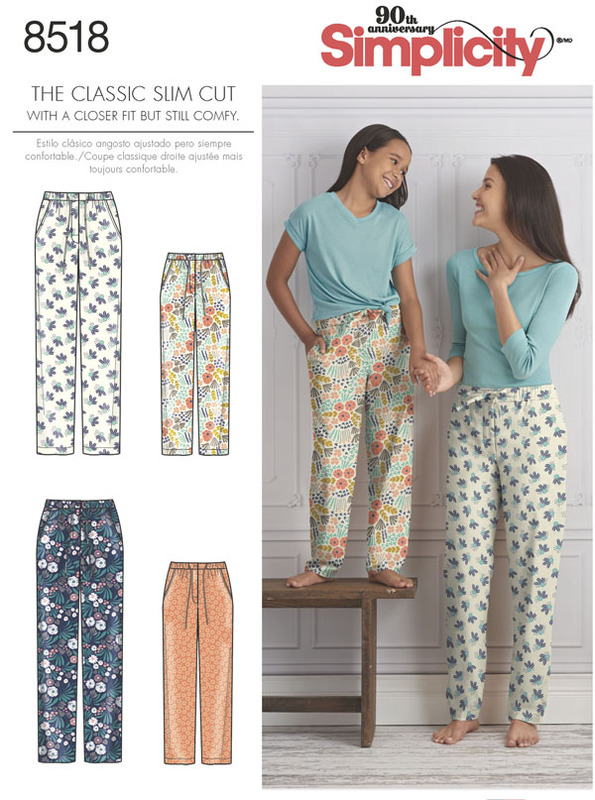 I also bought a new pyjama bottoms pattern, Simplicity 8518. Full price! I do think they've been a bit mean putting the men's version in a separate envelope though. I wanted to try a new pattern after the issues I had with Simplicity 1504. I had made a second pair of these for my sister, reducing the rise a lot, but they still weren't quite right. I was attracted to the description 'classic slim cut' on the envelope and the fact that it has a button fly. I don't need a button fly but I think it makes the pyjamas a bit fancier. My measurements were between the small and medium so I decided to cut a medium. Who wants their pyjamas to be too tight? The fit is a million times better than Simplicity 1504, its like they read my review and fixed everything! The button fly is really smart and the instructions clear however I realised part way through that they were suggesting way too much interfacing so skipped it on some of the pieces. Next time I make these I'll interface even less as it gives too much stiffness at the front. I over sewed the crotch seam to add extra strength. When I make these again I'll try and add a little length to the back crotch seam to give my bottom slightly more room. I couldn't get any 1 1/2" inch elastic so had to use 1 inch. I reduced the size of the casing a little too much so it was a struggle to thread the elastic through. If I ever come across 1 1/2" elastic I'm going to buy several metres. I'm so pleased with these, I'll definitely be making another pair! Super cute. I need to make some new pjs too. Thanks! I love sewing pyjamas in prints I wouldn’t dare wear out!